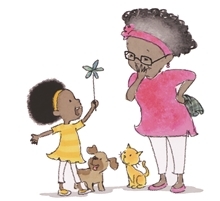 Narrator Sisi Aisha Johnson shares the rhyming and rhythmic fun of family and friends who are filling Grandma's house to the gills. As relatives and guests arrive bearing turkeys and biscuits, lemonade and cheesecakes, sweet potato pie and cantaloupe in ever increasing numbers, it's clear that a solution for the gathering is desperately needed. Who will craft a plan? Johnson narrates in tempo with the background music and uses pauses and emphasis to encourage young listeners to rhyme along with the "cool uncles all in a line" who bring "jugs of lemonade icy and fine," for example. Additionally, Johnson underscores numerical order. With the book in hand, listeners will have much to locate and count in the illustrations.